Extratropical cyclones are accompanied most time with multiple clouds levels. In the example above, a cirrus shield accompanies a subtropical jet over the southern boundary of the United States. That cirrus prevents the satellite from seeing any low clouds that may be present. To detect/diagnose low clouds and fog in such regions, other data sets must be used. For GOES-R IFR Probability fields (shown in the toggle above), that other data set is low-level saturation in the Rapid Refresh model. If the model suggests saturation is present, IFR Probability fields will show a strong signal even where cirrus shields prevent the satellite from viewing water-based clouds near the surface. That is the case above. IFR conditions are widespread in the scene above are are diagnosed quite well by the IFR Probability fields. This entry was posted in Plains, Texas on November 30, 2015 by Scott Lindstrom. On Sunday 22 November, fog developed over west-central Minnesota with sub-freezing temperatures on the ground. The animation of the GOES-R IFR Probability fields, above, shows the slow enlarging of highest probabilities in the region around Glenwood and Alexandria where IFR Conditions were observed. The Brightness Temperature Difference fields, below, show a signal over much of the region. One of the benefits of GOES-R IFR probability fields is that the use of Rapid Refresh model output screens out regions where mid-level stratus is more likely. Only regions in the model that have low-level saturation show the highest IFR Probabilities. GOES-R IFR Probabilities also give a consistent signal for IFR conditions when high clouds move over a surface fog. At the end of the animation above, probabilities decrease somewhat in regions over western Minnesota where high clouds are encroaching. Those high clouds prevent the brightness temperature difference field, below, from detecting surface fog. This entry was posted in Northern Plains on November 22, 2015 by Scott Lindstrom. Strong Extratropical Cyclones, such as the one affecting the central and eastern United States on 11-12 November 2015 (1200 UTC Map on 12 November is here), generate multiple levels of clouds that make it difficult to detect fog/low stratus from satellite, because intervening cloud layers get in the way. GOES-R IFR Probability fields, however, because they incorporate near-surface information from the Rapid Refresh Model, can yield useful information about the likelihood of IFR Conditions. The toggle above shows data at 1300 and 1400 UTC over the northeast United States. Highest IFR Probabilities are removed from the coastlines of New England — as observations confirm. Note how the Adirondack and Catskill regions have higher probabilities, where terrain is reaching up into the stratus deck. Features in the IFR Probability field are strongly related to surface-based observations of fog and low stratus. The toggle below shows IFR Probability fields and GOES-13 Brightness Temperature Differences as 1300 UTC. Features in the brightness temperature difference field have no relationship to surface-based observations of fog and low stratus. This entry was posted in Multiple Cloud Layers, New England on November 12, 2015 by Scott Lindstrom. 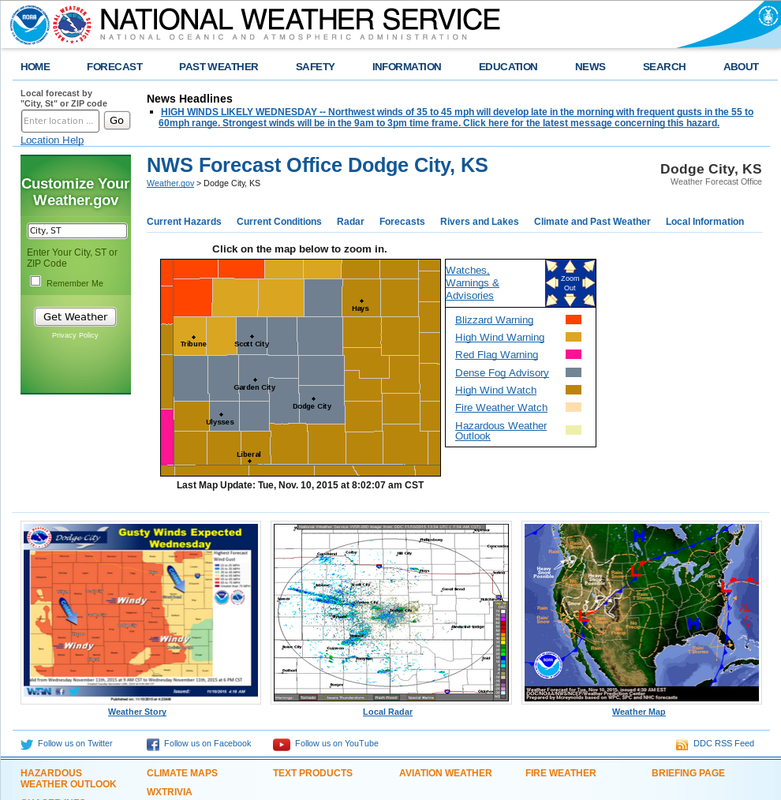 Dense Fog Advisories were hoisted over western Kansas in response to the development of dense fog in the early morning on 10 November 2015. The hourly evolution of GOES-R IFR Probabilities (top left, bottom left), GOES-13 Brightness Temperature Difference fields (10.7 µm – 3.9 µm, upper right) and GOES-R Cloud Thickness fields (Bottom right) are shown above. Both IFR Probability fields show highest probabilities over western Kansas where observations report IFR conditions. Portions of northern, central and eastern Kansas have strong returns in the GOES-13 Brightness Temperature Difference field, but IFR Probabilities are small and IFR conditions are not reported. In these regions, Rapid Refresh Model model output does not show low-level saturation and the IFR Probability algorithm correctly recognizes that IFR conditions are not likely despite the presence of stratus. It is the fusing of data in this way that gives the GOES-R IFR Probability field superior statistics (compared to the Brightness Temperature Difference field) in fog/low cloud detection. Maximum cloud depth observed is more then 1200 feet. This suggests a long time before fog dissipation unless winds increase over Kansas. GOES-R IFR Probabilities based on GOES-West show somewhat higher values than those based on GOES-East data; this difference arises because of the very oblique view of Kansas from GOES-15. This entry was posted in Plains on November 10, 2015 by Scott Lindstrom. Fog was widespread over the central United States on the morning of 3 November, and Dense Fog Advisories were commonplace. The toggle above compares the Brightness Temperature Difference field (10.7 µm – 3.9 µm) with the GOES-R IFR Probability field at 1145 UTC on 3 November. (This toggle is much faster) IFR Probabilities use near-surface information in the Rapid Refresh Model to screen out regions where Brightness Temperature Difference signals are showing elevated stratus rather than fog (For example, the region around Columbus MS). IFR Probabilities are also low in regions with a modest brightness temperature difference return (most of eastern Nebraska, west Texas, southern Indiana along the Ohio River); these regions do not include stations observing IFR Conditions. This entry was posted in Deep South, Midwest, Plains on November 3, 2015 by Scott Lindstrom.